Clark, an 8-year-old Treeing Walker Coonhound arrived at the Bladen County, North Carolina Animal Shelter along with Bella, a hound mix. Like Bella, he was severely neglected, heartworm-positive, malnourished, infested with fleas, and suffering skin infections and sores. Both he and Bella were rescued by Louie’s Legacy Rescue in Cincinnati, Ohio. Clark has undergone months of recovery being ministered to by his foster family and is ready for adoption. Long Ears Alive! helps other coonhounds and foxhounds in dire situations like Clark but needs donations to do so. Thanks to our donors who fund the next coonhound or foxhound or mix in need! Donner’s cherry eye is gone! Donner came into the Pocohantas County, West Virginia Animal Shelter with a cherry eye and Coonhound and Foxhound Companions paid $40 for its successful treatment. Donner has since been adopted by a member of the shelter staff. He cross-country skis with his owners during the winter and runs with them the rest of the year. Donner is loved; look at that smile! Thank you to those kind donors who helped pay for her care. We could not do it without you! Loretta Lynn, a 1-year-old black & tan coonhound, almost didn’t make it. She was found in an abandoned strip mine in Upshur County, West Virginia, with a severe gunshot wound to the head and serious injuries to a back leg. County animal control officers rushed her to a local vet where she was under treatment for months. When she was able to leave the vet, Loretta Lynn was rescued by the American Black & Tan Coonhound Rescue, adopted by her foster into a household with several other dogs, and given the new name, Ellie Mae. Long Ears Alive! contributed to Loretta’s months-long treatment. Thank you to the donors who helped pay for her care! Dan began his journey toward an eventual happy ending in not very happy circumstances. Dan, a young Treeing Walker Coonhound, found himself at the Bladen County, North Carolina Animal Shelter, full of intestinal worms and heartworm-positive. 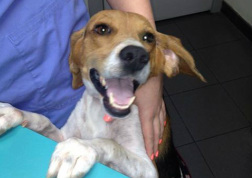 Coonhound and Foxhound Companions contributed $50 toward the cost of his heartworm treatment. Dan was rescued by Triangle Pets Alive, in North Carolina, and adopted soon thereafter. The little girl in his adoptive family has become his fast friend. Thank you to all who contribute to Coonhound Companion's Long Ears Alive! fund, making stories like these possible. We couldn't do it without you! 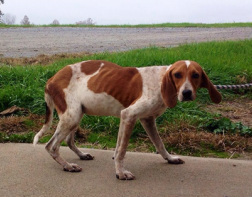 A 10-month-old coonhound puppy, Aggie was found as a stray in rural Ohio. She was suffering from a bad leg injury but it was diagnosed as healed by the shelter’s vet. Riley Spain, a teenage rescuer in Kentucky, agreed to foster her. Riley’s vet told her that Aggie needed to have her leg re-broken and surgery for a dislocated hip. Dr. Ira Niedweske, a New Jersey vet who works closely with Coonhound and Foxhound Companions was consulted; he offered to operate on her leg and hip. 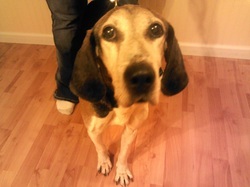 Coonhound and Foxhound Companions paid $450 for her transport to New Jersey and her interim care, raising money online. One of her donors applied to adopt her, and after a home visit, was approved for adoption. She recovered nicely from surgery and her new adopter flew to New Jersey on May 1, rented a car, picked her up and drove her back home to sunny California. Aggie is now Agatha Christie and she lives happily with The Unsinkable Molly Brown and Annie Oakley, all rescue dogs, and three rescue cats. She is pain-free at long last! Jethro was a stray senior coonhound in a western Kentucky shelter who was so skinny and sick he could barely walk, scheduled for euthanasia, when a soft-hearted teenager, Riley Spain, became determined to save his life. He had a mouth full of rotten teeth and pus-filled infections on his body. 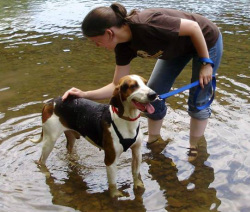 She reached out to Coonhound Companions for assistance and Jethro's long road to recovery began. Jethro lived with his savior, her family, and 3 other dogs. He had a grassy fenced yard and loved to chase squirrels. He was adored by all who knew him. He made Riley laugh out loud every day. Jethro passed in July 2014 of cancer, after living his sunset years happily with Riley. He died in her arms. Read Jethro's complete story here.